First screenshot of Sadness revealed? There’s some question over a recent in-game screenshot of Sadness for the Wii that has been making its rounds on the interwebs. Recently, in a forum over at IGN, there was a lot of rampant speculation when one of the informed posters said he had acess to the screens and posted one and then was prompted immediatly by Nibris to take the thing down. Well, being that you can’t keep good dirt down, a few managed to get a hold of the screenshot and shared it with those of us who a.) aren’t quick on the rumor mill forum draw and b.) don’t have an IGN account to view their every forum topic. It’s not known if this screenshot is in-game, cut scene, or cutting room floor material, but I’m curious to see more of what the game looks like. Sadness is a period game that is said to take place before WWI. The story revolves around a mother trying to protect her narcoleptic son from werewolves and Likho (one-eyed old maniacs). 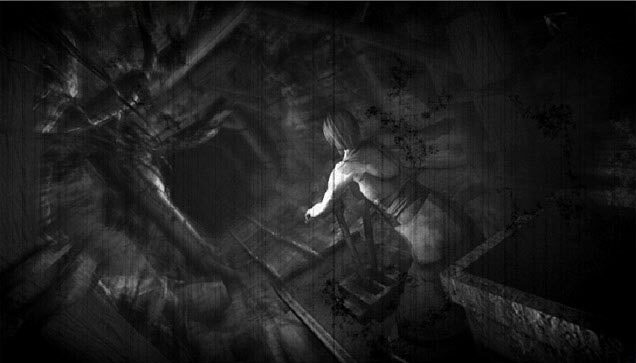 Sadness garnered attention because the art style is rendered completely in black and white and according to the head of Nibris, Piotr Orlovsky, the game is meant to scare the player by atmosphere rather than bloodlust or violence. I’m interested to see how they can pull off a whole game in black and white, especially by today’s graphic standards — though Schindler’s List and The Good German would serve as a good examples — but if the screenshot turns out to be for real, we could have something new and interesting on our hands. No release date on the game, but new gameplay footage and trailers is said to drop in May.